CHICKEN SOUP FOR THE INSANE: Mera Number Kab Aayega??? BT-Acumen, Tata Crucible and now BEQ. My National Runners-Up juggernaut continues. The pain of having lost the Finals of Brand Equity Quiz on the last question seems to have subsided to a very large extent. Gone are also the "What if?" nightmares that I have had ever since. Magic moment: Semi-finals tie-breaker against Vizag Steel. After we answered 'First Euro transaction'...jumped from my seat...walked behind it...punched the air...shouted a 'YES'...turned back to see my grinning partner...gave a hi-five...and both shouted 'YES'. Pure, unabashed joy. This is what one quizzes for. Will never forget those five seconds for the rest of my life. 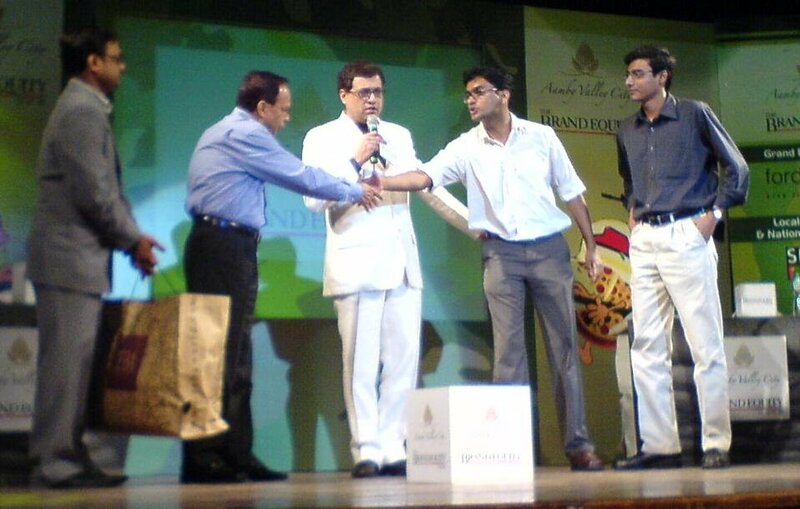 For me the Magic Moment will always remain the Quiz Finals of IIM-A, wherein you zapped me, Acharya & the Quiz Master Siddhartha Basu by replying "LVMH" on just hearing "In 1854"
Winning the silver consistently is not a joke. Proud of you. (ps: am saying u won the Silver, not lost the Gold :-) and you know wat that means, dont you? Bakwass bandh kar...the party is due!! That "How many zeroes in a crore" was the pits. The LVMH answer, I just happened to remember it. But, the look on Sid Basu's face was PRICELESS!!! What I will also remember forever is the way we fought back in the last round of BT-Acumen West Zone Regional Semi-Finals. And then proceeded to make mince-meat out of the same team in the Finals. And I know all that jazz about consistency. But, it hurts. Being a quizzer, you know...it hurts. Hahahaha...Nice guys. Now you are assuming that I am a nice guy. Had not been readin blogs for sometime so saw this only now! Would you feel better if i told you that i had to shell out whole 2.01 lakhs to get that ford ikon in hand (ie: 1.32 lakhs TDS, 47K road tax, 17K insurance and 5000 registration)and around 70-80 irritating STD calls to get the work done. On the win, we know that in a derek quiz it is usually just luck-someone or the other will get those blatantly repeated questions. Also we know it just depends on who is quicker on the draw..we were almost down n out b4 my pardner somehow got the last 2 right on the buzzer!So that was that!